Long Long ago, before Lord Rama met Hanuman during the course of events set out in the Ramayana…Well, thats the time that the few Kondanda Rama Temples that there are, hark back to. Five kilometres from the Shamshabad Bus Station is a quiet little village called Ammapalli. In this quite forgotten leafy corner of the city outskirts is a centuries old temple that has long been popular with movie makers and has yet eluded mainstream popularity. Believe it or not but over four hundred Telugu movies have been shot here! & a few Hindi and Tamil movies too. For there is a sentiment among the Tollywood fraternity that a movie with even one scene shot here at this temple, will surely have a successful run at the box office and for a hundred days at the least. Did you know? This temple was extensively featured in the 2001 blockbuster Murari, the very same movie that launched actor Mahesh Babu’s career towards superstardom. The central theme of the movie revolves around an ancient temple and its powerful presiding goddess. Little surprise there then that this Seeta Ramachandra Swamy Temple in Ammapalli makes frequent appearances right from the opening credits to the very climax. 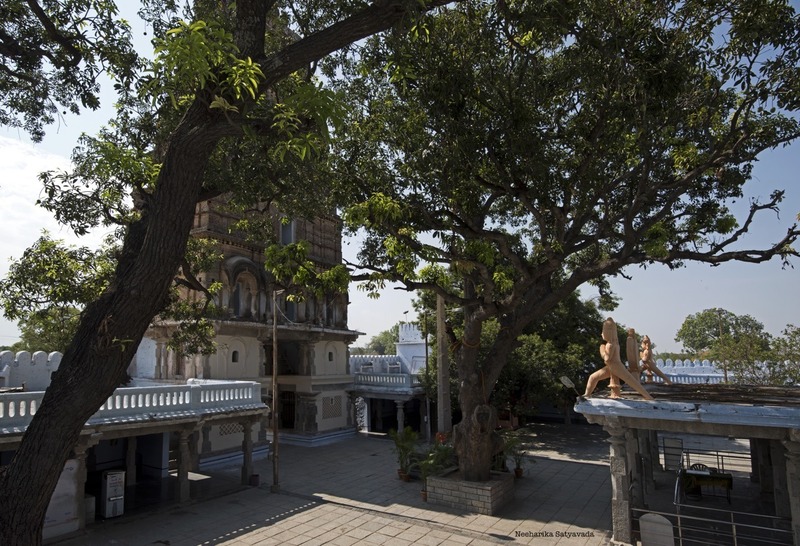 Locally known as the Ammapalli Temple, this is the Sri Seeta Ramachandra Swamy Temple in Ammapalli, Shamshabad. Spread over two hundred and fifty acres, it was built sometime in the 11th Century by the Eastern Chalukyas. Like most of the prominent temples dedicated to Lord Rama in our country, this thousand year old temple too marks the spot where he once stopped to rest during his journey in the historic-mythical Dandkaaranyam. Tree lined roads, manicured lawns and clearly sectioned off sandy areas lead you from the archway to the wide parking ground right outside the main temple. Along the way there are two smaller temples dedicated to Lord Shiva and Hanuman, a couple of mandapams and abandoned looking structures and a beautiful step-well hidden in a grove of coconut trees. If you love discovering beauty in little details, then this step-well is where you should start your exploration of the temple from. Corridors that start off in the Hindu style of pillared mandapams transition into Islamic arches as they go around enclosing the step-well. This was once the koneru where the Brahmostavams were held and people of all faiths would watch from these very corridors the on going festivities. Sri Rama Navami is celebrated in a big way here and the Seetarama Kalyanam is attended by thousands of people annually. As you walk along the grounds, it becomes evident that the Kalyanam has been but an age old tradition of the temple. For most of the structures on the grounds outside the main temple complex are built to serve but this one purpose. From the two storeyed kalyana mandapam to the edurukolla mandapam and even the Nagaar Khana, were the musicians would be seated to play the wedding tunes, they are all laid out for this specific purpose. Set against these structures is the main temple complex entered through a Gali Gopuram of ninety feet. Like every other aspect of this temple, the architecture of this too is strikingly unique with its colourful Seshashayee Vishnu carved into an otherwise drab brown tower. Then there is the bright white prahari or the boundary wall, which doubles up as a two storeyed corridor with benches on the upper level built into it. To serve as yet another viewing gallery undoubtedly. For all its splendour though, what stands out the most about the Amapalli temple are the ekashila (single stone) idols and the story behind them. These are doubly unique in the fact that, firstly, this style of carving the deity with the surrounding makaram toranam from a single stone was prevalent only for a brief period of time in history making them rare and invaluable today. Secondly, they date back to a time when Lord Rama hadn’t yet met Hanuman, making this a Kodanda Rama temple, where Lord Rama is depicted devoid of a bow and a Hanuman next to him. And adding to the intrigue is the Abhaya Anjaneya sculpted into the dwaja stambham (pillar) opposite the inner sanctum. On command from Lord Rama, he, Hanuman is said to fulfil the wishes of those devotees who seek it there and this is why when you go here to pray do not block the view between them! Route: Take the PVNR Expressway from the city. Around 8 kilometres before the Rajiv Gandhi International Airport, take the right adjoining the Shamshabad Bus Station. Another 5 kilometres on this straight road and you will find an archway on your left, leading to the Sri Seeta Rama Chandra Swamy Temple . Don’t Miss: Every month on the day that falls under Lord Rama’s birth star, Punarvasu, a Seeta Rama Kalyanam is held here in the morning. Followed by a Pallaki Seva and lunch. Such an interesting sorry behind the gorgeous Temple. Thanks for sharing it!